The only thing I wanted to see in Old San Francisco was the earthquake. I was prepared to wait nearly 80 minutes for that scene; prepared to sit through whatever melodramatic junk that preceded it, letting curiosity sustain me through this empty-vessel of a movie. What I got in the end were buildings of plywood and glue, rattling and buckling inward like the knees of an old drunk; then the onscreen death, via crushing, of Anna May Wong. 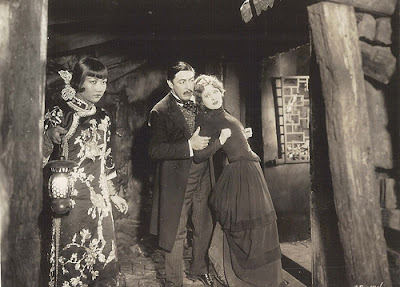 Racist and dumb, Old San Francisco is the kind of silent film we fans prefer not to mention when defending the appeal of the form to skeptics. It stars Dolores Costello as Delores; a radiant, passively Catholic, relentlessly bemused granddaughter of a Californian ranchero, Don Hernandez de Vasquez (Josef Swickard). Don Hernandez, we are told in the prologue, once defended his rancho from hordes of the gold-crazed with only his bravado and a sharp blade. Those days are over. Now, the old man has only one rickety servant and Delores to keep him company, and the greedy prospectors of 1849 have been replaced with a more refined breed of vulture. These ones wear suits, bulldoze mansions and buy judges. They want the old man’s land. The world has grown complex for Don Hernandez. Delores, bless her heart, lets him hearken back to better times. “We Vasquez are Spanish—our women remain at home,” she tells Terrence O'Shaughnessy (Charles Emmett Mack), one of the businessmen who pays her grandpa a visit. He’s enthralled with her, as any man would be, and she loves him right back, or so the movie insists, despite little emotional give from Costello. Maybe the actress felt, as I did watching her, that Delores Vasquez has the temperament of a contemplative, not a great lover. Her rancho’s walled courtyard and prominent Christ sculpture make it feel like a medieval convent, and Delores drifts through it free of longing. You feel nothing from her; you just watch. This is partly the point. 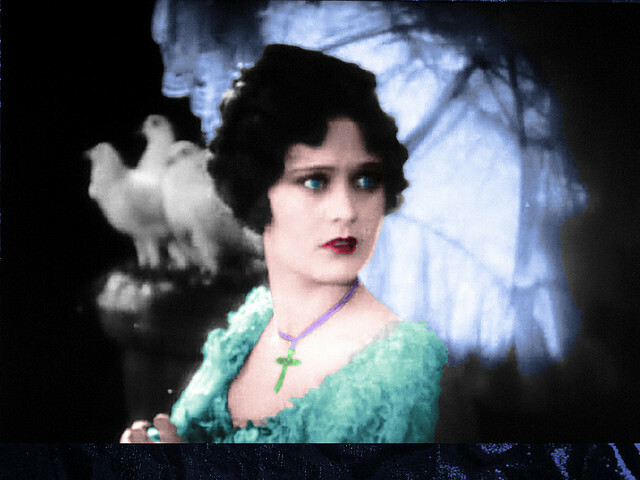 Delores is not so much an individual as a representation of an idea—in this case, an unsavoury one, too prominent in silent-era filmmaking. She is the virgin to be protected: Caucasian, Christian; unbowed through faith. Delores symbolizes what we fight for, no matter who’s fighting us or why. She’s a treasure of limitless value, if you’re feeling poetic enough to say so. But her value can be measured. “The fairest gem of the Occident,” declares one appraiser in Old San Francisco. Soon, Delores is sought by the devilish, grasping Chris Buckwell (Warner Oland), a power broker from the city. Oland enjoys high social position and great wealth, and he’s a curse upon San Francisco’s Chinese population, whose own expansion he seeks to restrict. The Chinese community elders detest Buckwell, but they accept his power over them because it is unwise to provoke a powerful figure and because, as a white man, he is outside their punitive jurisdiction. Yet Buckwell is actually Chinese. To pursue the wealth he craves, he’s developed a cover so deep even his own people don’t recognize him. Films of this sort must be transcendently good to overcome their content. Old San Francisco would be a lovely addition to any sociologist’s DVD collection, but as art, it’s just weak. The scene I’ll remember best from this one is not the quake, or the curls of opium smoke, or Delores’ glowing sword—it’s the moment when Buckwell’s face is bathed in the harsh light of the Vasquez’s sculpted Christ, and he’s revealed to have been Chinese all along. The camera draws in close, and we can see it clearly now. Oland is squinting. 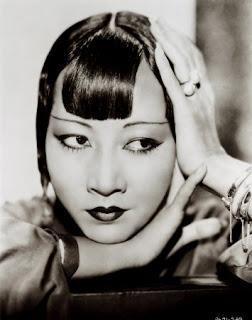 For some more silent-era Orientalism (got a better word? Feel free to submit it), check out my posts on The Ten Commandments, The Spiders, and A Tale of Two Worlds. The last one most resembles Old San Francisco, but is a better film, with an even more confusing take on identity politics. My copy of Old San Francisco is a made-to-order DVD, purchased online from the Warner Archive Collection. I am more than happy to award you with the "Stylish Blogger Award"
Lady, when you're right, you're right. I sent you an email just now, Karen. Let me know if you don't receive it. This film is a dumber-than-a-sack-of-hair melodrama and has some entertainment value. The racist anti-Chinese text (it ain't a subtext) is pretty noxious. There is a strange subtext. 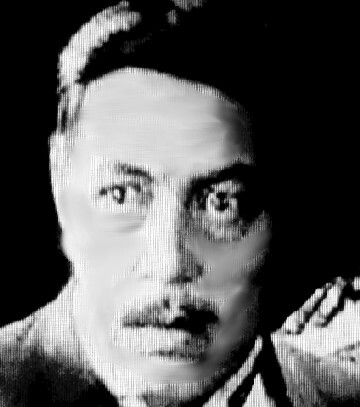 The character Chris Buckwell (played by Warner Oland who was of Swedish ancestry)is Chinese … not Eurasian, that is, of mixed "race", but Chinese. He passes for white until the heroine sees his Buddhist shrine and only then does she realize he's "Chinese." Huh? It's his religion that makes him "the other?" And he looks European … hmm. Any thoughts folks?